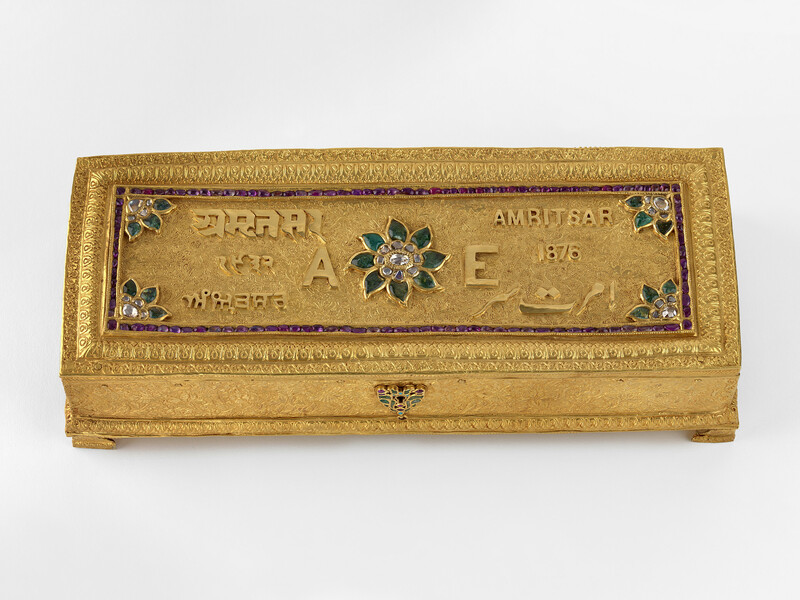 A gold casket containing an address of welcome to Albert Edward, Prince of Wales in Persian. The lid is engraved with patterns of birds and floral motifs and applied with English, Persian, Gurumukhi and Sanskrit lettering, which read 'A E Amritsar 1876'. The lid is bordered with rubies, emeralds and diamonds and flowers of diamonds and emeralds are affixed to the centre and corners of the lid. The sides of the casket are engraved with floral decoration and a jewelled lock-plate represents two parrots in rubies, emeralds and turquoises. The casket is lined with blue velvet embroidered with flowers and vines in silver- and gold-wrapped thread. Amritsar was one of the leading centres for this type of embroidery, called zardozi. The paper address is painted with gilt and floral decoration and the Prince of Wales's feathers.